The old is new—and cool—again. On this week's podcast we discuss the SV Dining issue. 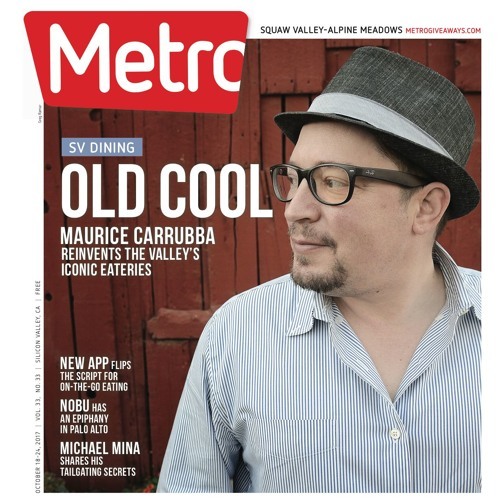 In particular, Maurice Carrubba and his brother, Giuseppe—who are perhaps the most successful restaurateurs much of the Bay Area has never heard of. This is because their specialty isn't opening up trendy joints, but rather in taking old classics that have seemingly been around forever and reenergizing them. They've worked to transform four vintage Silicon Valley restaurants: San Benito House in Half Moon Bay, which they bought from their father; The GrandView in San Jose; Osteria in Palo Alto; and La Forêt, their newest acquisition, which can be found deep in New Almaden on the southeast corner of Quicksilver Park. We also hit the Hit List. Up this weekend: the Rolling Loud rap festival in Mountain View, the Pow! Wow! public art festival and more.